~ How Can We Grow More Food Locally? ~ How Many Days Work in A Litre of Oil? ~ What is the best way for Transition Initiatives to use Facebook and Twitter? Liverpool Hope University 8th – 11th July. Please note that we welcome all workshop proposals. However, we can’t guarantee you a slot as time is tight! So if you don’t get a slot, please don’t feel bad, and remember that there’s always next year. Our tour this month starts in Australia, across to South Africa, then around the UK from Worthing, to Maidenhead, Amersham, Lewes and London plus more but we must also mention Germany, Ireland before we hop across to North America. How well do you know your neighbours? Having lived in Fitzrovia for over 48 years Fiona Green decided it was time to pay a tribute to all her lovely neighbours. How Can We Grow More Food Locally? Skill-swapping, gardening, knowing your neighbours – these are brilliant and vital parts of a hopeful future. But all the warm and fuzzy feelings we get from sharing bran muffins in the local town hall can sometimes obscure rather than highlight the reality of the situation we’re in. The ninth international conference of the Association For the Study of Peak Oil (ASPO) took place at the end of April in Brussels. The presentation slides & videos are online. While the signs are all around us nobody knows, and nobody cares. At least that’s how it seems. But people know something’s up. How Many Days Work in A Litre of Oil? Having often quoted “1 litre of oil equals 35 days of human work”, Rob Hopkins found his number challenged which sparked a lively discussion about what the real number is. A project to put solar panels on the roof of Harvey’s brewery in Lewes is tantalisingly close with only about £20,000 still to be raised this weekend. In 2010 Transition Linlithgow began ambitious bulk buying project for solar thermal heating systems for over 160 homes. London & the Thames Valley area. ~ ‘Imagine There’s a Future’ short story competition for writers resident in SW England. There are a couple of places left in the training in London on May 14/15, and we can do those for a discounted price and also places left on Wivenhoe, Essex training 4/5th June. keep it so? Is it shrinking into a small core of overwhelmed people? GROW YOUR GROUP consultancy and training believe that successful groups need the same sort of care and attention as a garden. We now have a page to explain where else we live on the web; to provide the more ‘social network-y’ types with our social network locations, and the initiative webmasters among you with tools to connect your sites with ours, and the most popular feeds to embed on your sites and aggregators. What is the best way for Transition Initiatives to use Facebook and Twitter? 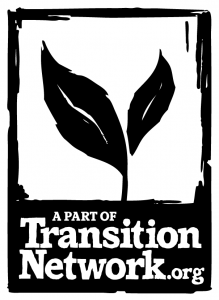 Official Transition Network Facebook page. Happiness and good conversation are carbon-negative technologies that deserve re-discovery. Our poor specimen earthling continues his adventures into possible futures.